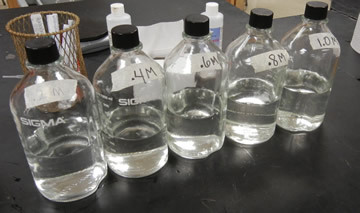 Distilled (deionized water) - approximately 9 liters for a class, they will use a lot of this! 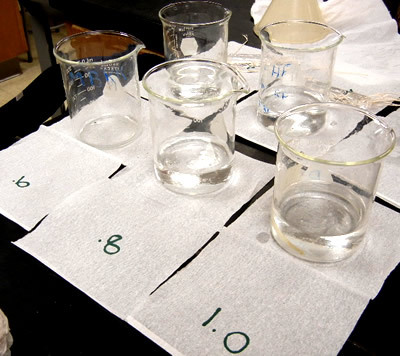 *You absolutely must use deionized water for this experiment to work. Tap water contains unknown amounts of solutes. You can obtain DI water from chemistry labs. Try contacting local colleges if your school doesn't have the capability to make DI water. You can also order from amazon, but that is a really expensive way to get DI water and you will need a lot of it. I have found DI water in supermarkets before, usually labeled "distilled." The dialysis tubes do not need to be exactly the same, as the main measurement is % change in mass. Advise students to tie the string very tight. Data will be unreliable if the bags leak. I also suggest that they leave some room in the bag. Osmosis will cause the bags to GAIN water, and they should have a greater mass at the end of the 20 minutes. My class periods are 50 minutes long, so 20-30 minutes is usually the longest we can keep them soaking. Leaving them overnight does not work well, I think because the bags do start to leak. 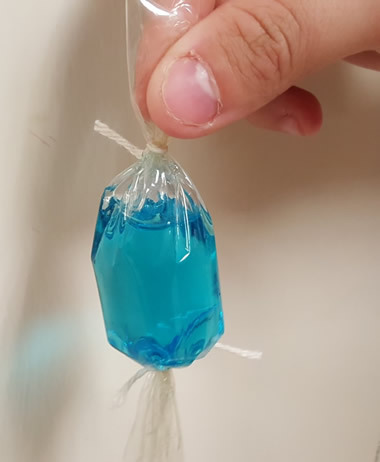 You can use food coloring in the solutions to make things more "exciting." The food coloring is also a good way to keep track of unknowns if you choose to do the extension experiment. The beakers contain distilled water. Make sure students keep track of which tube went into each beaker. This lab requires a lot of beakers, it is perfectly fine to substitute with plastic cups and that also has the advantage of being able to write directly on the cup. Be sure to watch students closely at the beginning. I've noticed that some of them, after setting up the tubes will forget to weigh them before dropping them into the solution. 0.2 M Generally, the masses will go up in all of the tubes except for the distilled water tube. If this is not observed, it may be a good time to talk to students about errors. Once common problem is that the tubes leak. Cutting potatoes can be done with a cork borer or with a french fry cutter. 0.2 M Answers will vary depending, the graph must be constructed to determine the molar concentration of the potato cores. 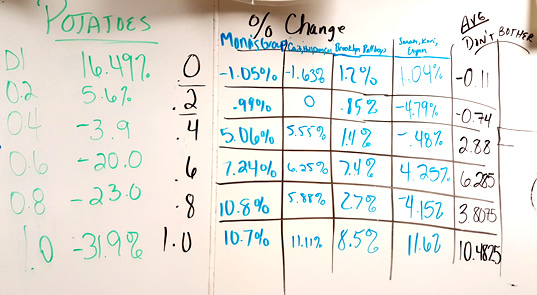 Data from 2015 - Students shared results on the board. I no longer have students graph the class average. The numbers are usually all over the place (hey, maybe a good time to refer back to the concept of STANDARD DEVIATION) because some of the bags lost mass. 11. Design an Experiment: If you are given a solution of sucrose that has an unknown molarity (.2, .6, .8, 1.0), how could you use potatoes, distilled water, or other known solutions to determine the molarity of your unknown. Color code the solutions you made in part 1 with food coloring and remove their labels. Place them into test tubes and challenge students to devise a method to determine the molarity of each tube. There are several ways students could figure this one out, challenge them to work together on a solution and don't give them too many clues!